Today I'm drinking Helios Ale brewed by Victory Brewing Company in Downingtown, Pennsylvania. 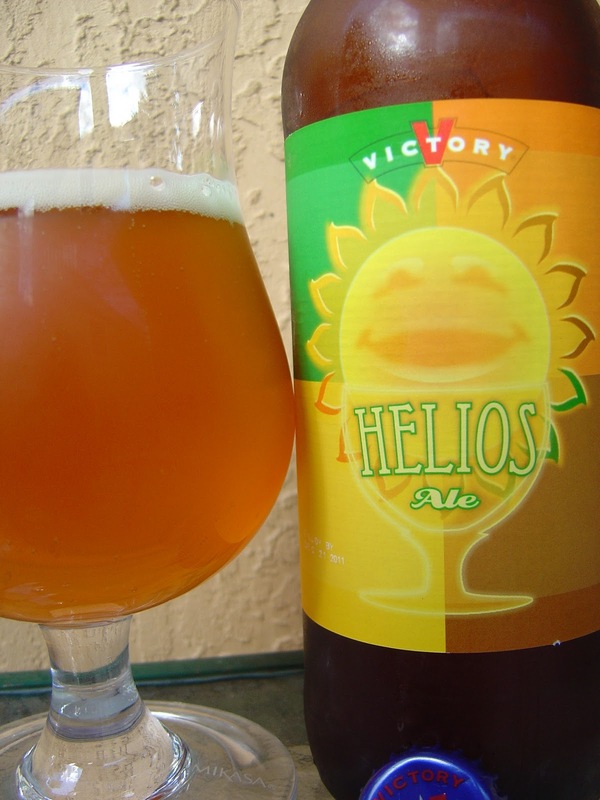 The label depicts a very happy sun seemingly rising from a glass of this beer. Nice colors. Enjoy by Dec 21, 2011. Fruity citrus aroma, oranges and apricots. Not very strong. You start with an interesting fruity yeasty flavor combination. Oranges and lemons along with funky yeast. The flavors are quite bitter, like chewing on a lemon peel. Some spicy clove and black pepper sneak in next. You will finish with some metallic band-aid strange spicy tart bitter in your mouth. Really, I do like me a good saison, but nothing really seemed to work with this beer. Too many generals and not enough privates, or something like that. Your 7.5% alcohol was not really noticeable. This reminded me of that skunky flavor that is so prevalent with pilsners. Body was weak, carbonation was good, flavors were OK. I finished all 22 ounces, but it was out of dumping guilt. There are many better beers in this style.